The overall tally of six gold, five silver and 14 bronze medals at the end of day six put the country in 10th spot in the table with China leading the pack by quite a distance, having already crossed the 100-mark. Tenacious rowers fought through exhaustion to redeem themselves and the first-time pairing of Rohan Bopanna and Divij Sharan delivered a tennis gold but India's most successful day at the 18th Asian Games was not without its share of heartbreak. There was no shooting gold to be celebrated on Friday but Heena Sidhu's 10m air pistol bronze was creditable enough even as 16-year-old sensation Manu Bhaker once again cracked in the final after a good qualification round. Among the disappointments, kabaddi once again formed the core of India's woes. Like its male counterpart, the defending champion Indian women's team too lost to Iran, albeit in the final, to collect a better medal compared to men, who ended with a bronze yesterday. The humiliation of finishing without gold in a sport that is indigenous to India would have been hard to take had it not been for the stout-hearted effort of the country's rowers and a thoroughly clinical performance from Bopanna and Sharan. The rowers, all of whom belong to the Indian army, showed a soldier's spirit to come back from the disaster that was yesterday when none of them found the podium despite being in contention for four medals. It was an especially special moment for Bhokanal after yesterday's forgettable show, when he had failed to complete his event. 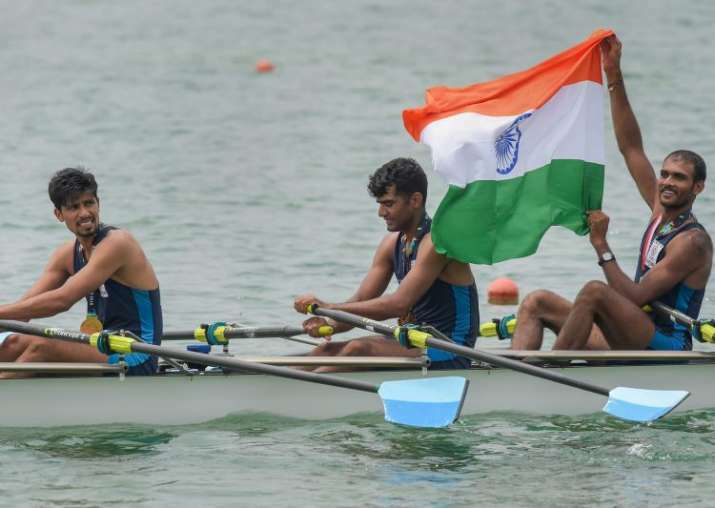 Before landing the top prize, India bagged two bronze medals in the sport through Rohit Kumar and Bhagwan Singh in lightweight double sculls after Dushyant Chauhan started the day with a third-place finish in lightweight single sculls. Dushyant had to be stretchered off the medal ceremony after just about standing through it and throwing up later. Rower Jagvir Singh too needed medical attention right after the race and he could not even breathe properly. "Yesterday we had a bad day but soldiers never give up. I told my teammates that we will go for the gold and we will give it all. It was about karo ya maro (do or die). And we did it," Sawarn, senior most member of the gold-winning quadruple sculls team, told PTI. If rowers were all grit, there was sublime coordination on display in the men's doubles final featuring Bopanna and Sharan against Aleksander Bublik and Denis Yevseyev of Kazakhstan. The Indians came out trumps 6-3 6-4 in 52 minutes to claim the men's doubles top prize, which has now gone to India for a fifth time. "This is really special for me. This medal especially goes to the people of Coorg. They are going through tough times (after the floods) and in Kerala also. Hope this can cheer them up," said Bopanna. The lone Indian in fray in the men's singles event, Prajnesh Gunneswaran, settled for a bronze after losing 2-6 2-6 to Uzbekistan's Denis Istomin in a semifinal that was much more competitive than what the score-line might suggest. Medals were also assured in squash where Dipika Pallikal, Joshna Chinappa and Saurav Ghosal advanced to respective singles semifinals with facile wins. Aadil Bedi kept India in the medal hunt in golf, holding the third position individually and helping the team be second at the halfway mark. The men's hockey team remained unbeaten, mauling Japan 8-0 in its third preliminary match to stay on course for an expected gold and Olympic qualification. But then in Jakarta, it was another day of disbelief for Indian kabaddi as Iran became their nightmare for the second day running. This time, it was the women at the receiving end in an exciting final. There were shocked faces in the Indian camp once again as the country came to terms with Iran's rise as the new powerhouse of kabaddi, a medal in which was taken for granted at the Asiad every four years. Not to mention the continuing poor show in archery, where the ones in recurve signed off without medals in the individual events. Those in compound are still in fray in individual competitions but aren't exactly the favourites going by current form. There was bad news in badminton with top shuttlers Kidambi Srikanth and H S Prannoy getting knocked out of the Games after shock defeats in the second round ended India's campaign in the men's singles competition. After Srikanth lost 21-23 19-21 to Wong Wing Ki Vincent of Hong Kong, Prannoy followed suit going down 12-21 21-15 15-21 to Thailand's Kantaphon Wangcharoen. In gymnastics, Dipa Karmakar finished fifth in balancing beam, her jittery comeback from a knee injury not quite going as planned at least at the ongoing Games here. The swimmers signed off without a medal, the only heartening aspect of the campaign being Srihari Natraj and Virdhawal Khade bettering a few national marks. The boxers began their campaign too and it was day of mixed results for them. Veteran Manoj Kumar (69kg) eased into the pre-quarters but Commonwealth Games gold-medallist Gaurav Solanki (52kg) went out with a stunning opening-round loss. Manoj prevailed 5-0 over Bhutan's Sangay Wangdi to make the last-16 stage and set up a clash with Kyrgyzstan's Abdurakhman Abdurakhmanov. However, Solanki was beaten in a unanimous verdict by Japan's Ryomei Tanaka, the 21-year-old India's defence all over the place against the southpaw.